Palmer Memorial Chapel, Columbia and Sumter, S.C.
At Palmer Memorial Chapel, our professionals have an unsurpassed level of expertise and give attention to the smallest of details in arranging a funeral service that you can be proud of. We provide services beyond what most people think of as the traditional role of the funeral director. We have years of experience caring for families, from all walks of life. Each family comes to us because we are leaders in our profession, dedicated to excellence in service, and have had the highest integrity for over 80 years. The Palmer tradition of service did not begin with Palmer Memorial Chapel founder, Edmund Perry Palmer, but with his father, Robert John Palmer of Columbia, S.C.. Robert John Palmer was a respected and successful businessman who was one of the few men of color elected to the South Carolina House of Representatives during the period of Reconstruction after the Civil War. 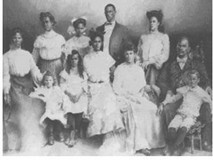 His ninth and last child was Edmund Perry Palmer who was to become Sumter's first licensed, African American mortician. We have years of experience caring for families, from all walks of life. Each family comes to us because they know we are leaders in our profession, dedicated to excellence in service, and have the highest level of integrity.